From the Baldwin County Courthouse, go east on Hancock St. and follow Highway 22 (Sparta Hwy) east for 4.1 miles. 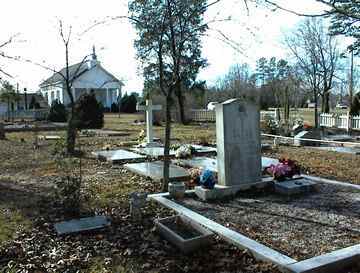 The church and cemetery are on the right at 449 Sparta Hwy. Some extra info is per Rev. Edward Boyce Nelson, Sr.
God must have needed another angel. Only T. J. appears on gravestone. First and middle names per editors. Wife of W. B. Franks. Grandmother. Buried at feet of grandmother, Lizzie Sanders Franks, per editors. Beloved wife of Henry E. Bonner. "My darling Carroll"
Beloved Daddy, Son, Brother, PawPaw. Playing cards inscribed on gravestone. "I have fought the good fight, I have finished the race, I have kept the faith." A separate marker contains a long tribute: "He was not given the gift of speech, but he said so much … "
The Lord's Prayer is on a marker between his marker and Irma Giles Estes' marker. A pink rose decoration appears on her grave marker. The Lord's Prayer is on a marker between her marker and Thad W. Estes Jr.'s marker. Only middle initial appears on gravestone. Maiden name is Layfield, per editors.